One of the most famous American brand icons of all time wouldn’t exist today if it wasn’t for the Russians, or more particularly one specific Russian – Jacob Youphes. Even those amongst you who might have correctly guessed at the brand being Levi’s 501s and who know their jeans history would be forgiven for still being confused; didn’t Levi Strauss create Levi 501s? Well the correct answer is yes …and no. 501s were and are produced by Levi Strauss, but the distinctive and differentiating features of the brass rivets and the double orange threaded stitching were innovations of Jacob Davis. Davis doesn’t sound very Russian, but then again he wasn’t born Jacob Davis. Jacob was born in 1831 in the city of Riga, then part of the Russian Empire, now the capital of Latvia. He was christened Jacob Youphes and was trained and worked as a tailor. In 1854 he emigrated to the United States where, shortly after arriving in New York, he decided to change his name and became Jacob Davis. After a number of years travelling and working in various states he finally settled in Reno where he opened a tailor’s shop in 1869. Much of his trade was in practical hard-wearing items such as tents, horse blankets and wagon covers for the railway workers on the Central Pacific Railroad. The fabrics he worked with were a heavy-duty cotton “duck” cloth and a heavy-duty cotton “denim” cloth. He bought this latter fabric from a certain Levi Strauss & Co., a dry goods company in San Francisco. In December 1870 Davis was asked by a customer to make a pair of strong working pants for her husband who was a woodcutter. Thinking how to create suitably robust pants for working he decided to use the duck cloth and then he had an idea to apply an approach he was already following on his tents and wagon covers. He decided to reinforce the potentially weaker points with the copper rivets, putting them in the seams and pockets in his new trousers. His customer and her husband were delighted and told their friends and colleagues. Word spread throughout the labourers along the railroad. Davis was soon making more and more of his working pants in both duck cotton and, as early as 1871, in denim cotton too. Realising the potential value in his reinforced jeans concept, but recognising he would need help and capital if his new pants were going to be a success, he approached Levi Strauss in 1872, asking for his financial backing in the filing of a patent application. Strauss too could see the potential, and on May 20, 1873, US Patent No. 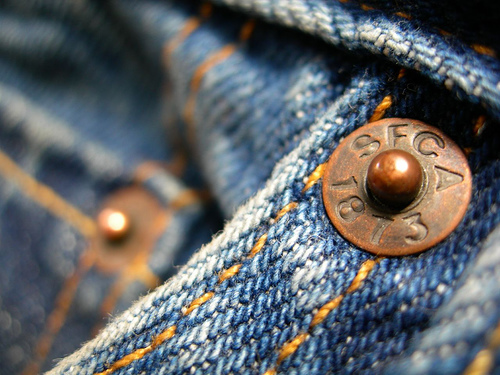 139,121 for “Improvements in fastening pocket openings” was issued in the name of Jacob W. Davis and Levi Strauss and Company. That same year, Davis started sewing a double orange threaded stitched design onto the back pocket of the jeans to distinguish them from those made by any of his competitors. This feature would be registered too; U.S. Trade Mark No.1,339,254. Strauss set up a new and sizeable tailor’s shop in San Francisco for the production of Davis’s working pants and asked Jacob and his family to come to the city and run this shop. As demand continued to grow, the shop was superseded by a manufacturing plant that Davis was then asked to manage. Davis continued to work there for the remainder of his life, overseeing production of the work pants as well as other lines including work shirts and overalls. The brand however resided with Strauss and over time Jacob’s contribution has become less well-known. Nowadays the Russian’s contribution is known only by fashion and brand historians … and you. Phineas Taylor “P.T.” Barnum is often considered to be the world’s greatest showman but another 19th Century entrepreneur who used a number of the same techniques and whose name is still known right around the world was Thomas J. Lipton. Lipton was born in Glasgow, Scotland in 1850. At the age of fifteen, he travelled to the United States. 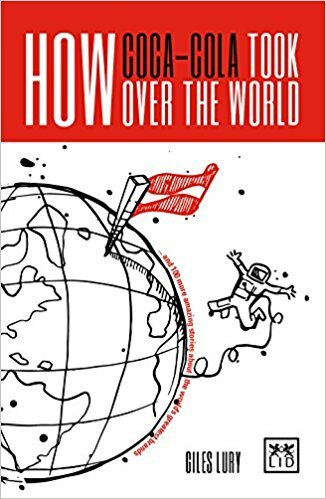 There he worked on a Virginia tobacco farm, a rice plantation in South Carolina, a streetcar in New Orleans before finding a job in a department store’s grocery section in New York City. It was here he witnessed “American” merchandising and advertising in action and learnt the lessons he would employ so successfully later in life. Unlike millions of others who had left for the United States never to return, Lipton saved up his earnings and went back to Scotland. After briefly working in the family grocery store, he opened his own in 1871. Lipton’s Market opened its doors at 101 Stobcross Street in the Anderston area of Glasgow. Other publicity-generating stunts included importing the world’s largest cheese and issuing ‘Lipton Currency Notes’. The store was a huge success and he quickly expanded. By 1880, Lipton had twenty stores, and by 1890 he had three hundred. He was a household name throughout Britain, renowned for his innovative retailing and promotional techniques. Rather than resting on his laurels Lipton moved onto and into new things; as well as starting to challenge for the Americas Cup, something he would win five times between 1899 and 1930, he decided to get into the tea business. Tea had traditionally arrived in crates and was sold loose, but Lipton would change that as his tea was now pre-packed at multiple weight options and standardised to guarantee quality. Later, Lipton would be the first brand to sell tea leaves in tea bags. The arrival of his first shipment of tea was done in traditional Lipton style with an accompanying parade of brass bands and bagpipers. In 1893, he officially established the Thomas J Lipton Co. and the Lipton brand of teas. Lipton® teas were an immediate success in the United Kingdom and the United States where, for his headquarters, he chose a warehouse in Hoboken, New Jersey. True to form he was backwards in announcing his arrival and built a huge Lipton’s Tea sign that could clearly be read from any point in New York harbour. 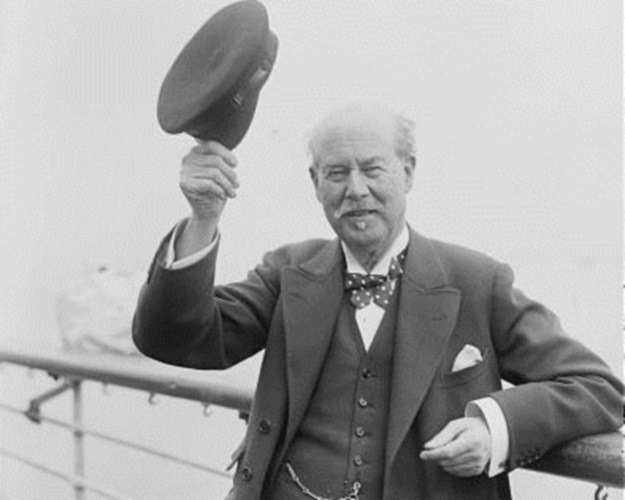 In recognition of his exceptional contribution to the country, Thomas Lipton was knighted by Queen Victoria in 1898, and became Sir Thomas Lipton at the age of forty-eight. Lipton® is now the world’s leading tea brand, sold in more than 150 countries. Wherever I go my constant curiosity means that a visit to the supermarket is a chance to introduce myself to some of the local brands. On a recent trip to Sri Lanka I couldn’t help but notice the dominance of CBL (Ceylon Biscuit Limited) and its Munchee brand in the biscuit aisle. I wondered what the story behind the brand was. My research led me to Mineka Wickramasingha, a multi-talented entrepreneur who helped establish the business through a combination of product innovation and commercial good sense. The story however starts with the first biscuit factory in Sri Lanka. It was a small-scale handmade biscuit venture in Dehiwela owned by a local businessman called Williams. In 1939, Simon Arthur Wickramasingha, Mineka’s father, acquired this factory, launching ‘Williams Confectionery’ with just 10 employees. It performed well and grew steadily. In 1957, the factory was upgraded and mechanized using old Baker Perkins lines from the UK. When Simon Wickramasingha died in 1961, M.P. (Mineka) and his three brothers N. P. (Pali), R. L. (Ranjith) and R. S. (Ramya) took over the business. In the 1960s the Ministry of Education in Sri Lanka, with the assistance of the US based organisation, CARE, provided schoolchildren with a cup of milk and a bun as nutritional supplements to their midday meal. However due to an inability to maintain the quality of the bun, CARE began assessing alternatives. Mineka Wickramasingha identified this as a major opportunity and using his skill, developed while studying for his Bakery Science degree from the Borough Polytechnic, (now known as the University of South Banks, UK), he developed a tasty high protein biscuit. This and a single-minded pursuit led to them winning the contract. His recipe has subsequently been adopted and used internationally by CARE. As the existing factory in Dehiwala was restricted in its capacity, the company opened a new biscuit factory at Pannipitiya in July 1968. The factory was operated by the newly formed Ceylon Biscuits Limited, a subsidiary of Williams (Williams owned 30%, the Wickramasingha family 30%, E. B. Creasy (an English trading company) 30%, the workers 5% and other shareholders 5%). The funding from the contract allowed CBL to import two biscuit manufacturing lines from Germany, one of which was to be used for the new nutritional biscuit and the other would allow the company to expand further into the consumer market. 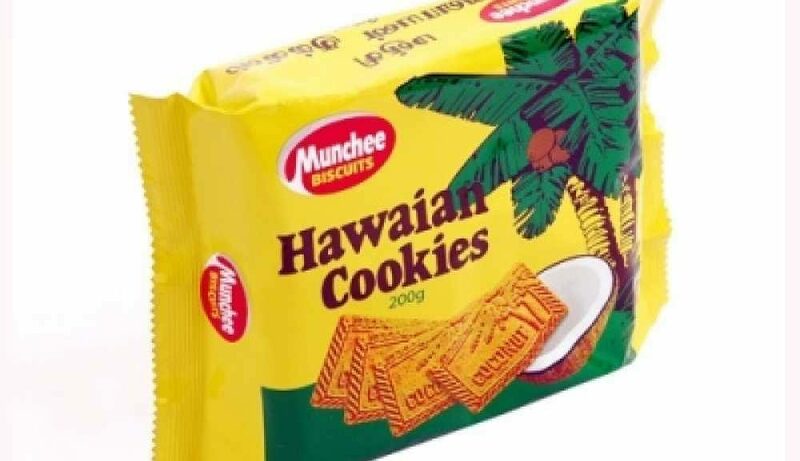 A new range of biscuits comprising some generic biscuits like Nice and Ginger Nuts and two of its own innovations, Hawaiian Cookies and Milk Short Cake was launched under the brand name, Munchee. The brand now has about 60% of the domestic market. Mineka is now the president emeritus focused on quality improvements and innovation. He has set up other companies in confectionery, canning and hospitality. He has served as the chairman of the Southern Regional Economic Development Commission. He is also a writer and his short story ‘Play Mate’ won the State Literary Award in 1996. His latest publication is the novel ‘E-danda’. 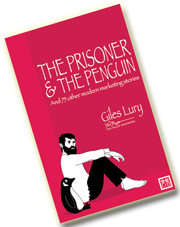 While the story traditionally focuses on this moment of inspiration and the subsequent despatch of the office junior, Edward Young, to London Zoo to sketch the penguin that would become the brand logo, further research uncovers others stories around the birth of the brand. Two revolve around the inconvenient fact that sales were initially slow and Lane even privately admitted to friends that the venture might fail. 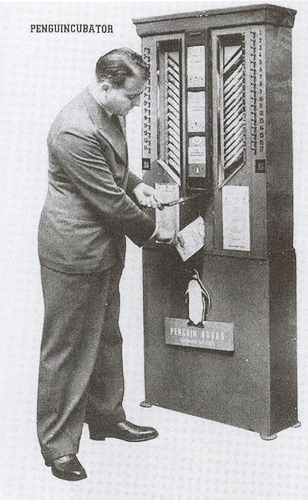 His first solution was the ingenious “Penguincubator” which appears to have been the first-ever (or possibly according to one source the second-ever) vending machine for books. Once built, it was installed outside Henderson’s at 66 Charing Cross Road, London and the books contained in it could be purchased for 6d. (Old English pence for anyone young enough not to get the reference – 2.5p and probably equivalent to c£2.50 now). However it wasn’t an overnight success and it drew complaints from nearby booksellers so didn’t solve Lane’s problem. The ultimate solution and the second story is a variation on the classic ‘chairman’s wife’ tale. Still looking for ways to build distribution and drive sales, Lane decided to try his luck with Woolworth’s, which at the time was the largest chain store in the UK. Provided he was patient he knew he would eventually been seen, as the retailer was famous for its open door policy, promising that any personal caller would get a friendly welcome and could meet the relevant buyer if they were prepared to wait. Lane’s luck however seemed to have run out as his sales pitch appeared to be falling on deaf ears. Prescott didn’t seem that interested, shuffled in his seat and looked out of the window. The problem it appeared was that while the books who sell for 6d and so fall within Woolworth’s promise to sell nothing that cost more than sixpence, Prescott felt they weren’t ‘fancy’ enough to compete with the colouring books and job novels printed on low-grade paper with brightly coloured dust jackets the store already stocked. Then just as he was about to pack up and leave Lane’s luck changed. Prescott’s wife who was on a rare visit to London poked her head around the door. She had finished her shopping and was now ready to be taken to lunch in nearby Regent Street. It was then that Mrs Prescott spotted the Agatha Christie Poirot Book “The Peculiar Affair at Styles” lying amongst the assorted titles spread around her husband’s meeting table. She enquired whether the firm was considering selling the softcover books, and announced that she would buy several a week if the price were sixpence or less. Prescott’s ears pricked up and suddenly he was interested. He decided to place an initial order of 36,000, each of the firm’s 600 stores were sent a crate of 500 books, and an additional thousand should be sent to the outlets at the major seaside resorts of Eastbourne, Bournemouth, Southsea, Margate, Blackpool and Skegness. Sales went well and by the end of the summer season, top-up orders from the branches brought the total sale to 63,000 books. On the basis of these are other sales which picked up too, Lane was able to establish Penguin as a separate business from Bodley Head.